Bridging the miles from Downtown to Hilltop! WEST LIBERTY, W.Va., Jan. 26, 2018 — West Liberty University officially opened its Downtown Center today with a noon press conference and ribbon cutting ceremony attended by invited guests including staff, business leaders, non-profit representatives and government officials. Also in attendance were WLU board members, including Board of Governors Chairman Les DeFelice and Foundation Secretary Judy Paesani. Dignitaries included Mary Jo Guidi, representing Sen. Joe Manchin III (D-W.Va.), Wheeling Mayor Glenn F. Elliott, Jr. and former mayor WLU alumnus Andy McKenzie. Percussion Ensemble Director Mitch Greco and students get some help from Topper the Bear! 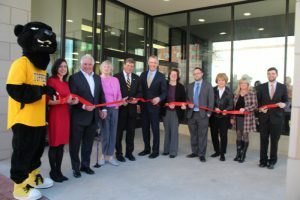 The ribbon-cutting ceremony was performed by Mary Fahey and Lisa Goodnight, representatives of the Wheeling Area Chamber of Commerce. 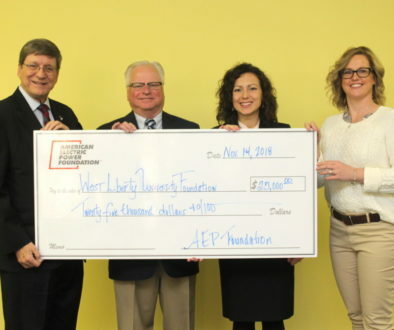 “West Liberty University is committed to economic development in our region and pleased to play a part in the revitalization effort that is clearly evident today in Downtown Wheeling,” said Dr. Stephen Greiner, WLU president. Located on the first floor of the RED Building, situated at 1100 Main Street, the WLU Downtown Center houses the WLU Foundation office and offers space to its hilltop campus for outreach to the Wheeling community in many ways. From left Topper the Bear, Foundation Executive Director Angela Zambito Hill, Board of Governors Chair Les DeFelice, Foundation Secretary Judy Paesani, President Stephen Greiner, Mayor Glenn Elliott, City Council members Wendy Scatterfield and Chad Thalman, Sen. Manchin representative Mary Jo Guidi, Chamber of Commerce representative Mary Fahey and Councilman Brian Wilson. 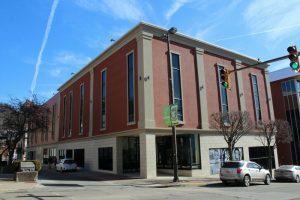 “Besides housing the office of our Foundation and its fundraising work, it is our vision that this new downtown location will expand West Liberty University’s entrepreneurship outreach to a wider audience in a convenient location. We plan to engage with the arts, non-profits, government and all community organizations,” Greiner said. 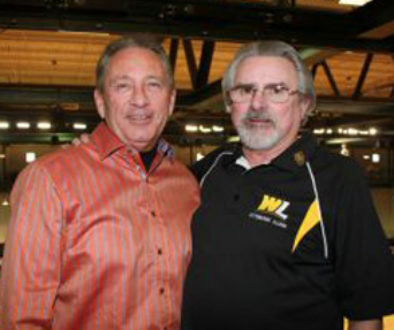 Mayor Elliott also commented and welcomed WLU to Downtown Wheeling. 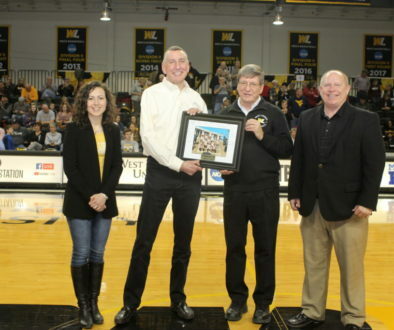 “We are entering a period of regional growth where strong collaborations amongst municipalities, universities, nonprofits, businesses and others are of paramount importance and West Liberty University’s new footprint downtown will bridge the 12 miles that separate the University and the City,” Elliott said. Additionally, WLU-TV 14 will have a mobile studio available at the Downtown Center and there is a changing art exhibit coordinated by the College of Arts and Communication. Admissions information also is available. Located just next door to the new Health Plan building, the 1100 Main Street building has four levels, with 48,000 square feet of office space and recently enjoyed a façade renovation. 1100 Main Street, home of WLU Downtown Center. Three levels are currently occupied with various tenants, including Regional Economic Development Partnership (RED) and the Wheeling Nailers on the third floor, the Chamber of Commerce and The Health Plan on the second floor, and West Liberty Foundation, the IRS Office, and U.S. Rep. David B. McKinley’s office on the first floor. West Liberty University’s space includes 1,750 square feet and consists of a large meeting room, several offices and large picture windows that face Main Street. Lunch was provided during the Open House and was catered by Tito’s Sloppy Doggs. 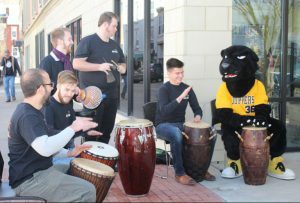 Music was provided by the West Liberty University Percussion Ensemble, under the direction of Mitch Greco, WLU director of percussion and world music. Hours for the WLU Downtown Center are 8:30 a.m. – 4:30 p.m., Monday through Friday. For more information, please call the WLU Foundation office at 304.336.5635.